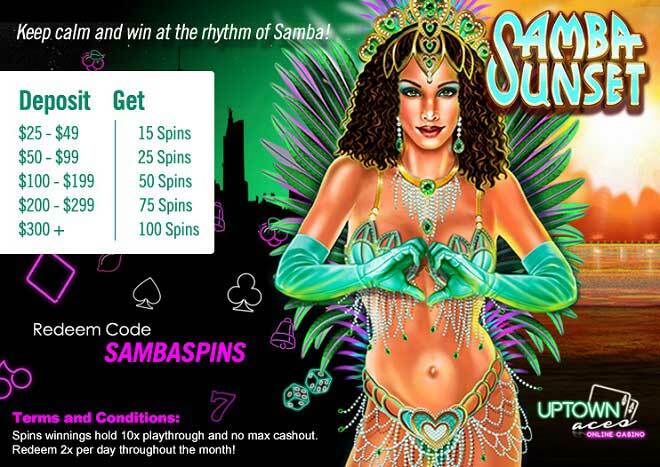 The rhythm of Samba is full of passion and wildness - and this September it will fill your account with up to 100 Free Spins when you deposit a minimum of $25! Hit the spin button of Samba Sunset for free and the beat will take over your account and fill it with wins! The heat will be turned full on when you trigger the Free Games Feature where Extra Dancers are added to the reels before each free spins game and all prizes will be doubled for each Wild that makes an appearance in a win during these free games. Dance to the beat of Samba Sunset and let it control your Uptown account this September when you deposit as little as $25!